It is said to be that the first slot machine was officially invented and patented by the American inventor of German origin-Charles fey in California, in 1887. The first machine was primitive automatic mechanism. A lot of researchers may also say that machine in fact was invented only in 1895, but not earlier. However, Charles Fey - Father of Slots left his mark in the world gambling history. Nevertheless, before the world recognition there were more attempts of slot machine creation prior to Fey's inventions. The New York Company played a great role for the invention of slots having produced the mechanism with drums spinning and displaying the originally poker cards. Though the winnings were mostly free beer or cigar, the machine gained recognition at once. Sittman and Pitt Company managed to create the first slots - the product that was designate to be forever imprinted into the gambling history. It is essential to know that the machine that was represented in 1887 and produced the repayments with the help of coins from 2 to 20 was called "New Nickel operated." Charles Fey managed to provide the gambling world with the phenomenon that later was named slots machine and played a great role in the evolution of slots. The first evidences of the new mechanisms were contained in the San Francisco Chronicle. The newspaper described the invention as the apparatus featuring the 3 reels almost hidden with Spades, Diamonds, Hearts, Horseshoes, and Bells symbols on them. The mechanism was operated by means of the nickel put into the slot to release the lever. Another gambling machine that appeared after the well-known Liberty Bell of Charles Fey was fruit machine that gave the winnings by means of the fruit chewing gums. It is interesting to know that the well-known symbols of melon and cherry are originated from the earlier fruit machines. The food means of the game appreciation was implemented to avoid the problems with law against gambling in different states. However, the invention of the first fully electromechanical slots was made in 1963 by Bally. It was called Honey money. The electronic approach to slots construction of the 196s made Honey Money nearly the first slots with the automatic money repay and also bottomless jumper. The machine first was able to conduct the repays without any attendant up to 5 hundred coins. 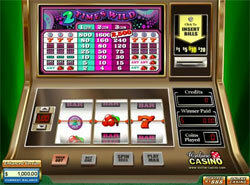 The popularity of such machines led to the emergence of the electronic games like online casino slots and their further evolution.